The Ribbon in Word 2007 and later versions of Word has a Developer tab that is turned off by default. To access the functionality of the Developer tab, you need to show it. Below you can learn how to show the Developer tab. Select File tab > Options > Customize Ribbon (see 1 in Figure 1). In the right side of the Word Options dialog box, select Main Tabs (see 2 in Figure 1) and turn on Developer (see 3 in Figure 1). Figure 1. 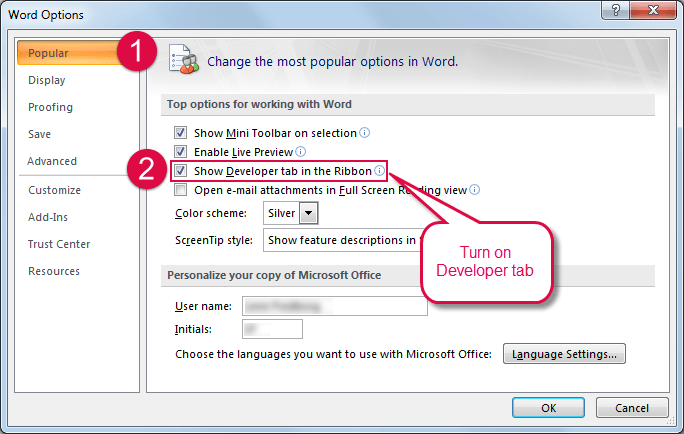 How to turn on the Developer tab in Word 2010 and Word 2013. Figure 2. The Developer tab is shown. Select Document Template if you want to see a list of currently loaded add-ins or see which template is attached to the active document. Select Office Button > Word Options > Popular category (see 1 in Figure 3). Turn on Show Developer tab in the Ribbon (see 2 in Figure 3). Figure 3. 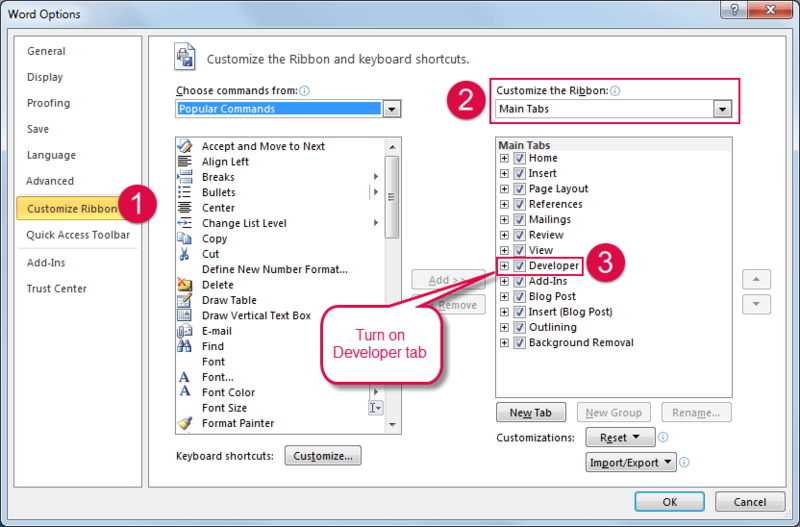 How to turn on the Developer tab in Word 2007. Now the Developer tab will appear in the Ribbon (see Figure 2).